When she arrives she has to contend with her mother (Judy Davis), who initially doesn't appear to know she even had a daughter, and then the rest of the town folk who all know the story of why Tilly was sent away as a child, branded as a murderer. Aside from Liam Hemsworth (obviously the 'love interest') and Judy Davis the supporting cast is like a whose who of A-list Aussie actors, some very well known internationally and others who would be very familiar to most Australians. Quite a few are initially unrecognizable but you'll get that feeling you've seen them before in something on Aussie TV. All the cast give great, if some what over the top (at times), performances that really suits the humor that runs through out the whole movie. It plays a bit like a cartoon but the dark undertones of Tilly's purpose keep everything grounded from being too light and slapstick. The movie has a real edge to it and I'm in two minds as to whether to call it a black comedy or not. It certainly gets that way towards the end but the earlier parts of the film contains humor that anyone would find appealing. I will say that, had Tilly not become a Dressmaker, she could have taken up pro golf, as could her mother - you'll see why if you see the film. Ultimately the film will leave you with few questions (maybe read the book by Rosalie Ham to see if that has more detail) but overall it's a fun story, with dark moments and humor, and definitely not your typical chick flick. If you like smart Aussie humor, stunning evening wear that has no place being in outback Australia during the day and Hugo Weaving getting to camp it up once again in a fun role, then this is the film for you. Would I like this film do you think? I'm not sure if it's still on at Carousel now, as I don't get the Hoyts Newsletter now. I must have dropped of their mailing list, but I haven't visited the web site for a while to look. I think it was reviewed in the Sunday Times mag, and I don't think it gave it a very favourable review, so I got put off it. It doesn't sound bad though, and has actors that I like. I think she'd find that sewing machine heavy to carry about though. It's only just come out so should still be showing at most cinemas. I do think you'd enjoy it. The humor gets a bit dark at times but nothing that's likely to be off putting. The Sunday Times critic wouldn't know a good movie if they saw one based on the reviews I read in that mag when I was there. 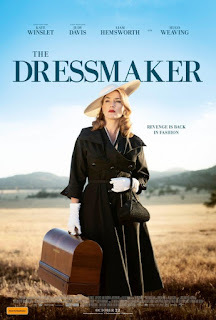 The Dressmaker is a lot of fun in a farce kind of way. It's not intended to be realistic drama. Fortunately she doesn't have to carry that sewing machine around for long once she sets up shop in the town. Oh, thanks, must check the web site out for Hoyts and tell them to send me the Newsletter again. I've got a Gold card to present to earn points everytime I go to a movie. Not sure if it's only to get things from the candy bar though. I've got my usual two free movie tickets from Carl that he gets from work on his birthday. I've got 'til next year to use them though, til end of Feb I think. They've got the cheap Tuesdays back again for $13 for everyone, but that's all I pay on other week-days now. It is showing at the web site. I think it's the first week. Times are 10am or 1-30pm which is the best time for me, apart from later in the evening. I only just went to Carousel last week, so don't really want to be going this next week. Wonder if the times will change though. They might do away with the 1-30pm one. Don't know how long it will be on for. I missed out on this film this time. I think it was on for two weeks, but I didn't really have time to go what with looking for a bit of shopping, as I got my first lot online. They were giving it good reviews on the radio at 6pr. Listeners thought it was good too. I saw the book in Dymocks with this same cover for around $22 something. Have to wait for the DVD.